"On the spectator's left is the gateway, a Tudor arch with a dripstone terminating in corbels, and a shelf supported by two lions, the work of the early part of the sixteenth century (Roper). 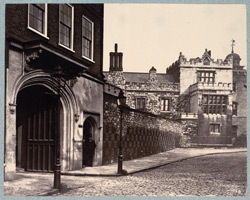 Archdeacon Hale, in his explanation of a plan of the Monastery, of a date somewhat later than 1430, says: 'We find two kitchens mentioned, ... the second, the building numbered 3, the remains of which are to be found in the wall next the present gateway of the Charterhouse, formed of squares of flint and stone.' In the description on the roll containing the plan, this kitchen is quaintly named 'Egipte, the fleyshe kychyne.'"